While crises are the laboratory of the future, the euro crisis is proving more like the alchemist’s lair. Back in November, the brilliant idea was touted, with considerable fanfare, of having the EFSF buy (at a discount) Greek and Irish bonds in the secondary market (in order to effect a non-default haircut). Despite the excitement it caused, that idea did not fly (for the same reason pigs find it hard to achieve the lift necessary to get airborne). The last few days of high drama, centred around Athens’ Parliament and beamed into homes the world over, seems to have spawned another grand scheme. This time, it has its origins in the French banks which have, in view of the calamity that will befall them if Greece defaults (and their Greek subsidiaries crash and burn), been spurred into a frenzy of mental activity. The result was an ambitious plan ‘voluntarily’ to roll over part of Greece’s debt. In short shrift, a meeting of about fifty, primarily, French and German banks was arranged in Rome, under the tutelage of Vittorio Grilli (head of the Italian Treasury and chair of the EU’s Economic and Financial Committee), to discuss the matter and reach a provisional agreement on its implementation. First, because the plan provides for insurance in the form of a kitty of high quality shares and securities into which the banks will plough another 20% of their proceeds from the maturing GGBs. The point of that fund is to provide a fund from which to draw in the event of a Greek default on the fresh 30 year bonds. Secondly, and much more importantly, because the new 30 year bonds that the banks will purchase will (Brady bond style) be shifted off their books and into some Special Vehicle. In other words, it will be as if the banks have not lent that money to Greece when it comes to Basle III and European stress tests. In effect, they will be allowed to utilise their ECB credit line to borrow cheaply and lend dearly on the basis of a capitalisation ratio that ignores their continued, long term, exposure to Greek debt. When this plan was taken to Rome, yesterday, the French added another ingredient to the mix hoping that it would make the proposal more palatable to their German counterparts: The ‘insurance’ kitty would be guaranteed by the EFSF and would contain EFSF bonds in such a manner as to give enough confidence that the kitty does provide participants with decent insurance against a Greek default. The German bankers, according to the Financial Times, liked the French proposal. In particular they loved the idea that their new Greek bonds would be both insured and off their books! What they did not like was the 30 year horizon suggested by the French. Labouring under the Keynesian anxiety that in the long run we are all dead, they counter-proposed a much shorter maturity (as short as 5 to 10 years). Looking at Greece’s debt in isolation, the fact of the matter is that the banks involved in the Rome meeting hold only about 43% of Greek debt. So, the proposal involves a roll over of less than 22% of Greece’s mountainous debt. Moreover, this roll over makes no difference whatsoever to Greece’s solvency position in view of the unforgiving fact that the new 30 year bonds will bear an interest rate of at least 5%. In short, the proposed scheme is attractive only to (a) the German, Dutch, Austrian and Finnish governments (who would now have to seek smaller bailout loans from their Parliaments) and (b) bankers who can have their cake and eat it. The ‘only’ non-beneficiaries are Greece and the stricken… eurozone. The question of whether such a deal will trigger an EOD (event of default) is up in the air. Most analysts fear that it would trigger such an EOD ,in which case it would defeat the purpose entirely (the purpose of the French plan being to avoid a default event). I left the worst for last: All this talk of what to do with the Greek debt must be seen against the background of Europe’s continued commitment to remain in denial of the simple truth that this is not a Greek debt crisis; that Greek debt is the tip of the iceberg. It is, I submit, inconceivable that the Greek debt can be dealt with while leaving the Irish, Portuguese etc. debt crises (as well as Europe’s Great Banking Conundrum) in abeyance hoping that they could go away magically. It only takes a second’s thought to come to the conclusion that schemes of this nature could not possibly address the systemic crisis at hand. In short, the French have shown, once again, that they can run rings around their German, far more stolid, counterparts. Alas, on this particular occasion what we have is Parisian folly getting the better of gothic naiveté in a contest of faculties that packs no hope of resolving our deep, systemic crisis. The new proposals illustrate graphically the folly and naive cynicism of the current Eurozone leaders. Dressed up as an imaginative and generous plan to rescue Greece and the euro, it is simply a transparent and feeble way of bailing out German and French banks for thirty years, at which point no one on the scene today, will be. It does nothing to cure the problems at the root of the Greek crisis, rather it exacerbates it by giving it the energy to run even longer, and thereby makes the situation worse. The only thing it allows is for the politicians in Europe to engage in an exercise of self delusion, while fooling nobody. Greece should not accept any bail out, but should be allowed to default and start again from where it will be left. Even if it has to be out of the Euro, that is a better solution than getting a new loan. Greece will suffer either way. It has to choose the way that allows the country to survive. If Greece is declared in default officially (it is already in default in practice), it will not have to repay the loan. The European banks that hold Greece’s debt will loose the money initially, but because of the credit default swaps, we do not know who is actually on the other side. The losses will be distributed around the world. Is this loss so big for the world to absorb? I do not think so. The tax payers of Germany and France have very small stake on this. The world does not want to see Greece default:a) Because of the European banks that hold the notes and b) Because of the shock that this will create to the world market. The world has tried this scenario when Lehman defaulted. The whole world felt the impact and the US government was criticized. Then the US government changed course, and, instead, saved AIG.The result? some of the banks in the US flourished because they got the bail-out money. The people in the streets did not gain anything. Unemployment is high, the economy is struggling. However, the banks that received the bail-out money payed huge bonuses less than 2 years later. It is important to see what Greece is gaining with any of these bail-outs proposals. AIG was given zero interest loan…. Greece with the 6% interest is not being bailed-out … it is being crucified. Also, do we know what is the bankruptcy law for EU countries? Does Europe have claim into Greece’s assets upon default? @NY the debt used to be in greek bonds largely . I believe there would have been no impact on Greece should have chosen to default on her creditors apart from the political pressure from other countries . There is international and european law afterall , stating that a government (when in state of necessity) should decide according to the needs of its citizens first and then its creditors . The same goes for MK2 and the plan of EU for 2013 . So right now , Greece has basically less options than it had one year ago . And i am afraid that , the longer it takes to default the less favorable the conditions will be for Greece . we do not know the true CDS exposure of Institutions such as Bank of America, Morgan Stanley, Goldman Sachs etc. as they ‘are allowed’ to treat their CDS position a secret in their reports. This is my point, I conclude this to be the true secrecy which enables a certain blackmail potential, as the Banks in question will always threaten systemic risk when faced with demands they dislike. I remember to well how all this started in Ireland, the drip feeding of Information flow Banks -> Government, a few weeks later, ‘we need more’ to be the result. As for BIS, while Greek liabilities for example are 93,5 % with European Banks and only 5% with US banks, 30% of the total has CDS contracts attached, in the total value of over USD 60 billion and here the relationship changes dramatically, as these both, direct and indirect derivatives are held to 56,3% by the US and 43,1% by European Banks. Hence, with 30 billion on the US side, theoretically, and depending on how it is concentrated, it could cause a severe solvency Issue for one of the big banks. In essence, imho, the power of Banks to threaten systemic risk in negotiations only exists because they are still allowed to treat this information as a business secret. You are right. Just like in 2008 no one had a clue who owned which and how many CDOs and CDSs, so now a veil of mystery surrounds the ownership and sources of CDSs taken out against Greek debt. According to DTCC (link here), as of 17/6/2011 there were 4,897 CDS open contracts against Greek debt with a Gross notional face value of 79 Billion USD and Net notional face value of 5 Billion USD. 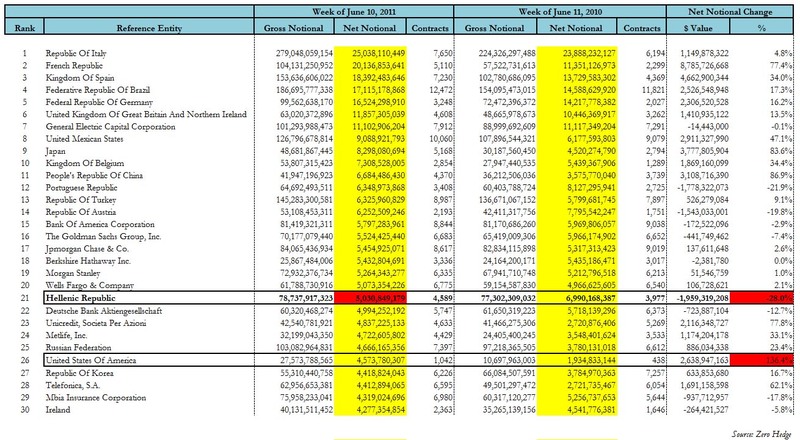 The way I understand it, is that in the event of a 100% Greek default, the total CDS global exposure is 5 Billion USD. So the CDS implications might not be as catastrophic as it is perceived to be. The tip of a large iceberg. Recall the official Sept 20087 estimate of CDSs underwritten by AIG? If you have other sources please share but here’s what I’ve got. So I stick to my thesis that Germany does not need an artifical low valued currency to be successful. Some businesses might go belly up, but then they did not have the right to exist anyways. Of course, they forgot to mention ways of overcoming the debt problem and why other countries apart from Greece are also currently close to default, despite they ‘ve done everything that the professors suggest for Greece to do right now, long time ago…Do they really believe those things? If yes, they have escaped reality for good, if no then they are mouthpieces of political parties and financial institutions! I am not a fan of this proposal by the French. >>>The ‘only’ non-beneficiaries are Greece and the stricken… eurozone. I understand that Grrece is not benefiting, but is it bad for the Eurozone (ex. DE, NL, FI & AT)? who do you think is gonna pay that new, higher interest rate on the rolled over debt when Greece will default? not me, I’m not in the EZ. And look who’s insuring the debt – it’s you my friend via efsf. and it’s bad for the EZ because it leaves leaks in the system. Basically, the banks don’t have to keep those bonds on their books, so in theory they don’t have to write off losses. But that doesn’t mean those losses don’t happen just because you don’t write them down. It just means you can sucker your shareholders by posting cooked up books; the losses don’t disappear in some other time and space. A bad loan is still a bad loan; if I don’t repay you, reality won’t change just because you refuse to write down the loss I’ve incurred on you. And allow me Yanni to ask some things which I found very difficult to comprehend. Why are they suggesting solutions that are condemned to fail? Do they have any ultimate goal? What do they want to succeed from announcing all these half-measures? Ok yes…they want to buy time…but then time for what? For inventing a new bubble? I can’t really bite that they don’t know what they are doing…How can they don’t know of the implications of their suggestions as you discribed them here today? Do they really ideologically believe to that lamed sytem that it will prevail and boom again increase the growth and prosperity of all nations worldwide or they are just vainfully trying to protect their carrers and their super dooper hyper-ego? Do they think that people can really bite again (even after all mass media are still on their side propagandising their blubberings as solutions)? What’s the difference between the swaps the greek government did with Goldman Sachs in 98 and 99s and the french proposed plan ? They both kick the problem twenty years later , WITH interest and greek assets and avoiding to write it on their books . If what i am saying is correct ( i am not an economist) , an officially declared wrongdoing and malpractice , for which Greece was accused and ridiculed for a prolonged period of time ( Although , it wasnt the only country to have signed such contracts) , now becomes an official plan . Well done !! Well , if things continue like this , there is no point being a member of the eurozone, at least for Greece . Maybe Germany will do us a favor and exit first . I imagine that Greek public debt is just a small part of the debt issues with the core Euro banks. The banks probably have even larger private debt holdings in the Mediterranean areas and so the pubic debt issue is the tip of the iceberg. There was vast real estate speculation in southern Europe in the aughties. And in terms of corporate debt, I can’t see how a Greek manufacturer could pay back the core Euro banks, now or ever. Insightful and informative as always, but I am genuinely surprised to see you so negative. Why wouldn’t these same criticisms have applied to the Brady Bonds themselves in the 1980s? And why are you so sure this would be bad for Greece? True, it doesn’t address the solvency question, but is that such a decisive objection? In a world of certainty equivalence, all you care about is the present value of your liabilities vs. your assets (or liabilities vs tax capacity if we are talking about the “solvency” of a government.) But we don’t live in a world of certainty-equivalence, and less so as the horizon gets longer. A lot could happen in 30 years, no? Maybe there will be an acceleration of Greek growth. Maybe there will be an episode of high inflation (correct me if I’m wrong, but it seems like even inflation in Greece alone would be sufficient to ease repayment, if the price elasticity on trade flows is low enough for the real appreciation not to matter too much.) Maybe there will be a move toward fiscal union in the EU, resulting in higher transfers to the Greek state. Maybe there will be an upsurge in anti-capitalist popular movements, or some other change in the political climate that strengthens Greece’s bargaining position and weakens the banks’. Three decades is a long time, long enough for lots of developments we can’t predict now that would resolve the solvency issue and leave just the liquidity issue, which this proposal at least goes way some way toward solving. Now you could say, things could also happen to make the insolvency problem worse. Greek growth could slow, the Eurozone could face deflation, etc. Yes, they could. But it seems to me that for Greece, the downside risk is effectively bounded. To a first approximation, the costs of default are the same for the borrower irrespective of exactly how much the lenders lose. And, I don’t see why a default in a few years would be any worse (for Greece!) than a default now. Meanwhile from the banks’ point of view it’s attractive largely because it shifts the risk of default to “Europe,” i.e. the ECB (and their national governments, I guess.) But isn’t that point 1 of your Modest Proposal is designed to do as well? So why don’t you see this proposal at least a small step in the right direction? I think the rate for the 30Yr Bonds will be 5.5%. As to the shielding of EU bank balance sheets from the toxic Greek debt, this is equivalent to what US banks did with their non-recognition of toxic real estate loans. They created a placeholder for the bad loans hoping in some sort of future RE price recovery. The so called “kicking the can down the road” approach. This is exactly what I think. The american housing crisis was created by lending large sums of money to people who in reality could not afford houses of that size. Now countries that cannot afford to will get huge loans. The next step is to securitize these “assets”, call them PBS* and sell it to stupid bankers ideally from state owned or influenced banks. Knut, The American housing crisis is about bank fraud, not about lending to people who could not afford their homes. The losses in the housing market on the original mortgages was half a trillion–not enough to send the economy into the tailspin it suffered. It was the equivalent of the Savings & Loans crisis. The major problem in the USA was that the bankers were running a scam, creating subprime loans out of wholecloth when they ran out of suckers (i.e. people with little money) to take the loans. In one such instance, an investment bank was inventing CDOs with BBB rated tranches in Las Vegas, selling them to investors, and then getting others to short them. That’s how they put tens of trillions at risk. It was banking and derivatives, not mortgages. Housing in the USA is still relatively cheap when compared to Europe. The major problem in the EUDSSR is that politicians are running a scam, creating debt guarantees to subprime loans. When they will run out of suckers (i.e. countries with little money) to guarantee the debt, they will just have magnified the problem. So I still believe that we have on a high level a similar problem. The american housing crisis was created by lending large sums of money to people who in reality could not afford houses of that size. Now I understand why you keep missing the point in most of your comments. There were several reasons, one of the reasons was the one I mentioned. Just because I have a different opinion than most people here does not mean that I miss the point. People pay me a lot of money to get my opinion, one of the reasns is that I say also what they initially do not wnt to hear. For the greeks this would be that they all are guilty, not just their politicians. Most did not pay taxes accoeding to the rules etc. when you say: “Most did not pay taxes accoeding to the rules etc.”, could you please quantify that with a percentage, and compare it to the Eurozone average? Thank you. I’m also quite surprised by your embrace of the concept of collective guilt (“For the greeks this would be that they all are guilty, not just their politicians.”). I take it you are not a great fan of Adenauer? the IMF brought together the 24 administrators. political forces to unite for the good of the country. to get over these small matters,» she said. Voulez-vous couchez avec moi ce soir Madame Lagarde? June 29th, the day of the vote, I remember too well when such an important vote was performed in Ireland, with the ‘majority’ of 2 votes they pushed it through. Perhaps it is worth noting that two of the biggest political scumbags in the Republic enabled this vote, which was responsible for billions to be shoveled from taxpayers to Banksters. As you might guess, both of them got bribed of course. Dear Yanni, just caught a brief view of you on BBCTV saying that the 50 billion Euro figure for income from flogging off Greek public assets to private enterprise is a scifi figure. Hats off to you for daring to tell the truth. Excellent article. Greeks are rightly proud of the history that shows they were the first to experiment with forms of democracy. They have suffered under military juntas, and have no intention of allowing a proxy junta like this to take place. Greeks will not accept this attack on their national sovereignty & denial of their democratic rights by European banks & international credit groups. That they should pay for the excesses, cronyism, nepotism & corruption by their corporate politicians is an affront they will not endure. Greece has simply become the first European test of the Chicago School of Economics policies that trashed the economies of so many countries around the world, lay behind the off-shore movements of US industry, and advised Chinese part leaders of their shift to feral imperial capitalism as outlined in Klein’s The Shock Doctrine. And te Egyptian protesters who have returned to, Tahrir Square know that, although they succeeded in ousting their home-grown dictator, the same international vultures are still in control of the new gavernment puppets and, no coubt, the country’s military as well. In that news fragment I heard from the commentator the only reasonable “excuse” in favour of greek interests in deciding against the risk of default now: That the government is buying time until we become solvent internally , i.e. our income matches our expenses, which will happen if the tough measures work. I must say I’m impressed. The Greek Parliament decided today to turn the whole population of Greece into modern day Helots. So we Northern ruthless Spartans can show up every autumn, during the crypteia, to kill you without fear of repercussion. Of course only financially. Thank you very much! Yves, she is good. And Harvard educated. However, all Yves’ remarks re: post 2008 US have been largely ignored. Her message is good, but no one is listening. The first (and preferred) roll over option on the table envisages private investors “voluntarily” agreeing to reinvest 70% of Greek government bonds maturing between mid-2011 and mid-2014 in new Greek government bonds maturing in 30 years’ time. These new bonds would carry a coupon of 5.5% plus a premium equal to annual Greek GDP growth (subject to a minimum of zero and a maximum of 2.5%) However, the deal would be subject to Greece agreeing to lend (presumably simply hand over) 30% of the proceeds of the new 30-year debt that it issued to a special purpose vehicle (SPV). The SPV would in turn use the money to buy AAA-rated 30-year zero-coupon bonds issued by a supranational institution and/or a European agency as collateral in order to guarantee the repayment of the principal on the new 30-year Greek bonds. The plan further envisages that the purchase price of these 30-year zero-coupon bonds would be around 30 cents in the euro, which equates to an implied annual zero coupon yield of about 4.1%. The effective floor on Greece’s annual interest cost would therefore be higher than 5.5%, as Greece would essentially be using 30% of the new money it raised to invest in high-grade zero coupon bonds paying a much lower yield. The “true” floor would be closer to 6.75% a year (with a cap of nearly 11%). Why would you shoot tear gas into angered crowds? I tell you, they have no tears left to cry. >>>they have no tears left to cry.